It was my first time at the Greenwich House Music School, which also doubles as a music venue for local artists. It was also my first time seeing Pharaoh’s Daughter, the band performing last Thursday night as part of the school’s 50th anniversary tribute to Café au Go Go, a club well known for musical eclecticism in the late 1960’s. Eclectic is certainly one word to describe the 7-piece band led by Basya Schechter (Lead Vocals), and features the talents of Meg Okura (Violin), Daphna Mor (Recorders), Shanir Blumenkranz (Bass), Uri Sharlin (Keyboard/Piano), Yonadav Halevy (Drums), and Mathias Kunzli (Percussion). This New York City based group weaves Middle Eastern sounds into what some call psychedelia and funk, for a vibe that resonates with something both ancient and modern. Personally, I could hear shades of everything from The Doors to Loreena McKennitt, with none of it sounding out of place or derivative, but I’m sure if you asked anyone in that room, you’d get different impressions from each person listening. Schechter’s stage persona was down-to-earth and accessible, her vocals strong and resonant. 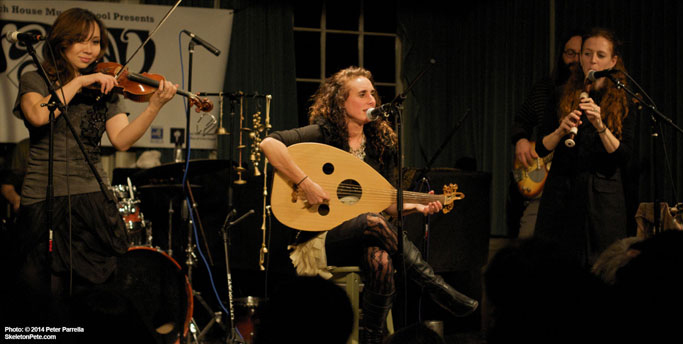 When she played Yona from the band’s 2007 album Haran (the song was dedicated to her young nephew, also in the audience), Schechter got the whole crowd to sing along. The venue was packed with members from many communities Schechter proudly proclaims herself to be a part of. Whether family, friends, fans, or other musicians and first time listeners (like myself), the room warmed almost instantly to her. 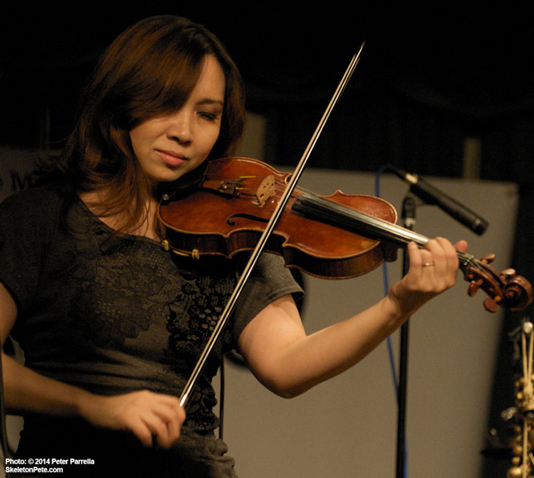 Though all the members deserve kudos, a special shout out has to go to jazz violinist Meg Okura, who was on fire that night. Her violin solos had me captivated. I have to admit it, this woman was so good, she made the violin look just as cool as any wailing lead guitar – possibly even cooler. I’ll probably get some flack from my guitarist friends, but sorry, fellas, she rules. Whether playing traditional Jewish songs, or originals, this group of veteran musicians had everyone, both young and old, dancing in their seats, or at the very least, tapping their feet to the rhythm. 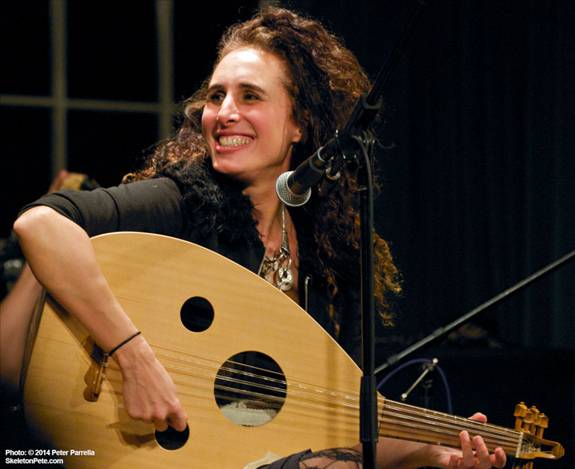 It doesn’t matter which community you belong to, what your background is, or whether or not you speak Hebrew, Yiddish or Spanish (all languages Schechter sings in), Pharaoh’s Daughter’s music transcends language, as music should – something for anyone who can listen with an open heart. They were a pleasure to see. For more on Pharaoh’s Daughter visit their site. For more on the Café au Go Go Revisited Series and the School itself, please visit the Greenwich House website for information on their mission and program offerings.